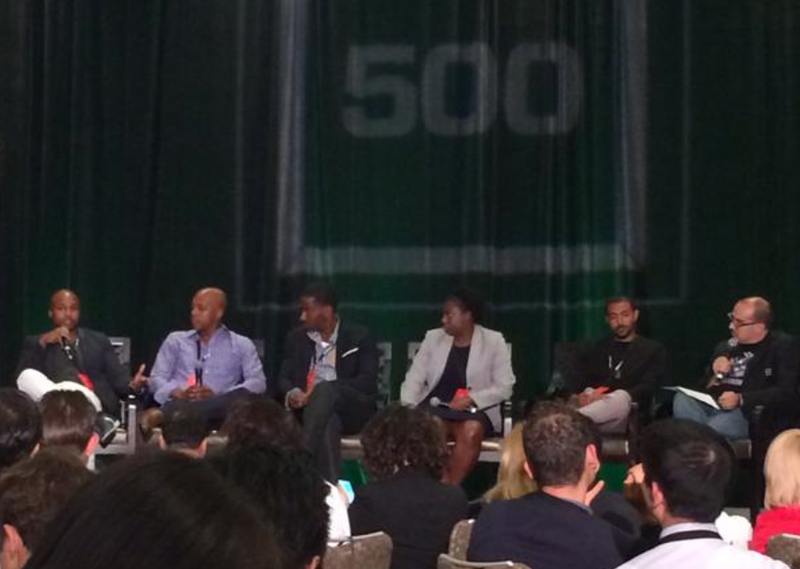 Dear White Venture Capitalists: If you’re reading this, it’s (almost!) too late. Venture Capital: capital invested in a project in which there is a substantial element of risk, typically a new or expanding business. In early 2013 I watched from the side of a stage in Abu Dhabi as a sea of 50k people danced along to my boss’ performance in front of an actual sea, beachside. As a production coordinator and road manager, I was being paid to travel the world and be around great music with interesting, gifted people — pretty much a dream job. It was always an insane rush to see a show from that vantage and I had come to the conclusion that nothing on earth was more fun or more interesting. Around the same time I started hearing about people like Troy Carter (Lady Gaga’s former manager), Ellen, Guy Oseary (Madonna’s manager), Ashton Kutcher, and others visiting Silicon Valley and investing in these apps that I’d never heard of. I was super curious to find out what could possibly be so compelling and exciting that it was pulling these people away from the rush I’d become addicted to. I started reading every tech and investing book and blog post and news article I could get my hands on. I watched hundreds of hours of youtube videos of tech mogul interviews. People like Chris Sacca, George Zachary, Dave McClure, and Brad Feld were among the first people I learned about, and I was absolutely fascinated. So I cold called them all:) I reached out to founders and CEOs of startups that I liked, and chased down big investors. Interviewed people, got to understand the world more and more, and suddenly I *got* it. It’s been 2.5 years since I first started getting my feet wet in this world and a lot has happened in that time — mostly wonderful, exciting, super positive and optimistic things. But I have some observations I’d like to share about the flip side of that. If you are an investor of the Caucasian persuasion, I cordially invite you to pull up a chair, turn off your Yeezy mixtape, and listen to me as if I were not an anomaly sent from another planet. Diversity talk can get really uncomfortable and awkward for all involved. While I genuinely believe most white people in tech (and in general) have good intentions, are well-meaning, and actually don’t need to be “taught” much about the topic, there are quite a few — who seem to be the loudest — who don’t know how to talk about it at all, or who do strange things in misguided attempts to overcompensate. The most dangerous thing that’s happening is that we’re talking about black and Hispanic founders and the African-American and Hispanic MARKETs like they’re aliens that need help. Not every black person came from a broken home, grew up poor, can double dutch or dance. For example, I am not qualified to show you how to nae nae. For that, I feel shame, but I am my own person. Don’t box me in! Your goal is to make money as a VC or accelerator who is investing other people’s money because you have a fiduciary duty to do everything in your power to bring your LPs returns. Therefore, if you haven’t hired a team of people who are of color, female, and/or LGBT to actively turn over every stone, to scope out every nook and cranny, to pop out of every bush, to find every qualified underrepresented founder in this country, you’re going to miss out on a LOT OF MONEY when the rest of the investment world gets it. The case for investing in diverse founders and diverse markets is more about doing everything you possibly can to not miss unicorns and decacorns and polyamorous butterflies (I just coined that, thank you) in underserved, untapped places. Plain and simple. It’s not about “helping” founders, it’s about fueling an untapped ecosystem so that you may be lucky enough to reap the rewards in years to come. You should be calling underrepresented founders and BEGGING them to allow you to invest in their company at the slightest sign of traction. Because of the blind spot investors have for this group of people right now, there’s an enormous opportunity to invest at undervalued prices. It won’t always be this way. Adjust your thinking NOW. Adapt NOW. If I were an established or emerging VC firm, I would take at least 5% of the capital called to seed as many founders of color as I possibly could in order to find the ones who are going to KILL IT. I’d also set aside another percentage for follow-on capital and I’d call all my co-investor friends and tell them to allocate some funds for future syndicate rounds in this space. And I would do that over and over again until I had it cornered. Til every black and Hispanic founder in this country knew my name and came to me first with any deal. If only 10–20 investments in this space are being done in TOTAL, the entire VC asset class is going to miss out in a big way. Investors simply aren’t casting a wide enough net. I’ll speak to you in a universal language most seem to understand: Drake. If you’re an associate or partner at an established venture firm and you want an advantage in a crowded space, get in touch with me. Every one of you should have in-house scouts searching for the black Zuck or the Hispanic Elizabeth Holmes. And those scouts need to be of color. And very smart and intuitive. And not white dudes who happen to have a lot of black friends and play basketball. Seriously. Right now. Email me. ARLANHamilton@gmail.com …invite me to your office or bowling or to a concert or out for sushi and let’s talk about it. You can follow me at twitter.com/ArlanWasHere!